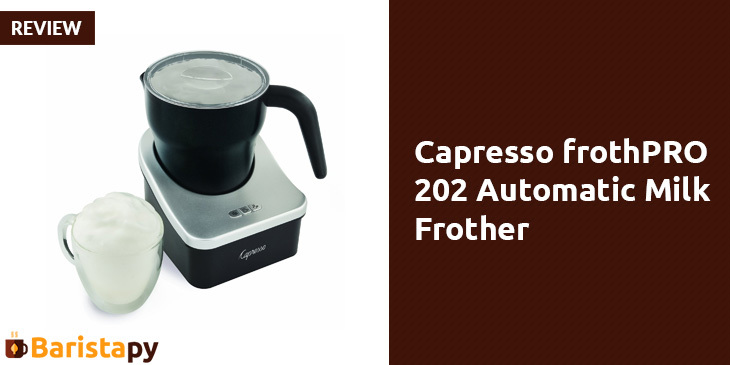 Capresso’s frothPRO 202 is another automatic milk frother and milk heater. However, at $56.95 retail and free shipping on Amazon, it weighs in at half the price of the Breville frother. Do you save money or do you end up with a compromise on quality? Let’s take a realistic look. 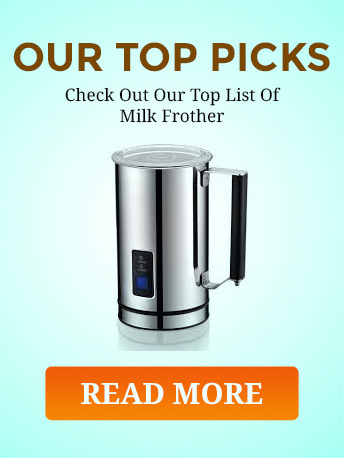 With this frother, you can produce hot or cold milk drinks or the frothed drinks—the lattes and the cappuccinos. This one is a fully automatic machine. Just push a button to select one of three temperature settings: cold, warm, or hot. On hot, the milk heats to 140 degrees. However, this temperature may not be hot enough as the optimum frothing range is 140 to 160 degrees. You do not get to designate an exact temperature. Also, you do not get to control the consistency of the froth with the Capresso. The machine does come with 2 frothing disks, but one is a replacement disk and not intended to produce a thinner froth. Users note, though, that the Capresso frothPRO truly does make quite a thick froth. And I note that you do get microfoam with its very small bubbles using the frothPRO. Handheld frothers usually fail to produce microfoam. Disk 3 is for heating milk for hot chocolate or chai. During heating, this Capresso does stir the milk to prevent burning it. Of course, you can choose the cold setting for cold milk drinks. Refreshing cold chai tea, for example. This setting is the one for adding in a powder. Capresso says it takes 3 to 4 minutes to froth your milk. And users confirm these minutes. The frothing time is not as fast as with the Breville. But again, the machine works automatically so you can do other work in the kitchen. The frothPRO makes plenty of froth or hot milk, but does not have the capacity of the Breville BMF600XL. Its pitcher holds 8 ounces of milk for frothing. And it can hold up to 12 ounces for heating up milk. Capresso’s frothPRO at 6 x 5 x 7 inches is a smaller machine—good if your counter space is tight. Weight is 3 lbs. The technology utilized is different than that of the magnet-driven Breville. The frothPRO has a spindle that runs the disk. I warn that the spindle does wear out and the machine won’t function without a replacement part. But the price to replace the pitcher is only $11.00 plus $7.95 shipping. Great for safety is the shutdown feature. It works two ways. When the temperature hits hot or warm, the machine stops all action. Also, when you remove the pitcher from its base while it is running, it cuts off. A ceramic, non-stick material covers the milk pitcher. Thus, cleaning is easy. However, if you accidentally drop the jug, stainless steel can better withstand damage. A little more care is required with ceramic. Nonetheless, the ceramic jug and plastic lid can be cleaned in the dishwasher. The handle does not heat up so your hands are protected from high temperatures. Capresso is a known manufacturer of beverage appliances such as milk frothers, coffee makers, espresso machines, coffee grinders, water kettles, and iced tea makers. A company with lots of manufacturing experience. The frothPRO comes with a 1 year warranty to back the appliance. Capresso does pack the appliance with instructions. However, users report that information on why and how to order a replacement spindle are not included. Nor is there help for removing a disk that is sometimes hard to pry loose at the jug’s bottom. 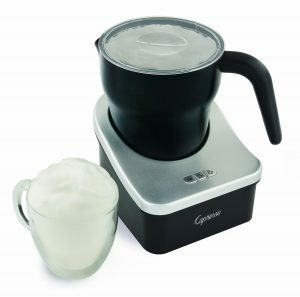 Q: Is the Capresso frothPRO 202 a good buy? A: The Capresso frother reviewed here is a good buy in an electric milk frother. The machine is a favorite of many reviewers as you can make coffee shoppe quality drinks on a budget. An excellent starter model. Buy this machine if you desire a good milk frother that costs much less.